Today marks the twentieth anniversary of Khumuun Bichig, the Mongolian newspaper from the Montsame Mongolian National News Agency in Ulaanbaatar. 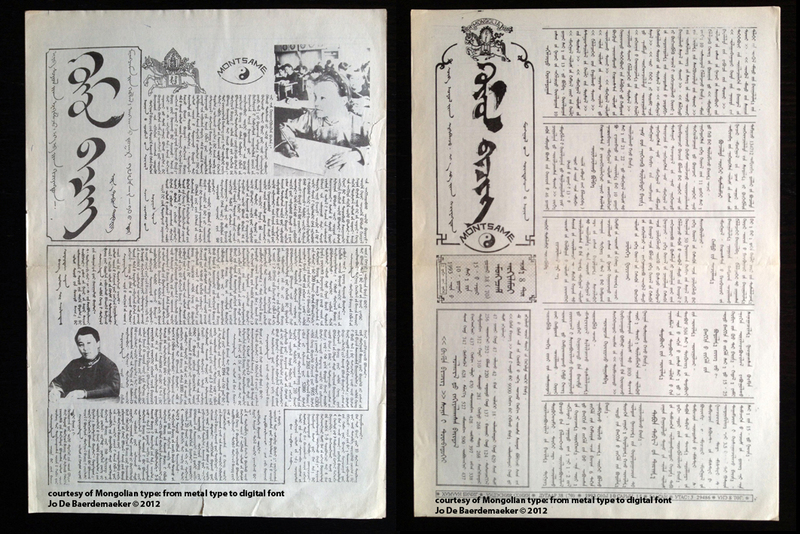 From the first day of its publication, on 10 May 1992, the four pages of Khumuun Bichig were set entirely in the Mongolian script and distributed throughout the country. In 2010, Khumuun Bichig‘s circulation reached 127 535 copies. Over the past twenty years Khumuun Bichig was restyled a couple of times, but remained to be an invaluable historical and educational document that continued to support Mongolian writing and calligraphy by collaborating with renowned calligraphers and Mongolian script educators, by reporting on various events and publications about Mongolian writing, and by organizing annual calligraphy competitions. It became an indirect teaching resource by providing a learning environment to anyone interested in the Mongolian script. On 22 August 2011, I had the privilege to visit the offices of Khumuun Bichig in Ulaanbaatar and to interview Altantsetseg Sampil, director and editor-in-chief of the newspaper. Miss Sampil showed several original copies of Khumuun Bichig from various periods, illustrating the different formats and layouts of the publication. She also introduced me to Bayarbat Khandmaa and Elbeg Andarzara, the two current editors and typesetter-designers of the contemporary digital edition. The entire interview was audio-recorded and a detailed paper on the meeting and history of Khumuun Bichig is being prepared. 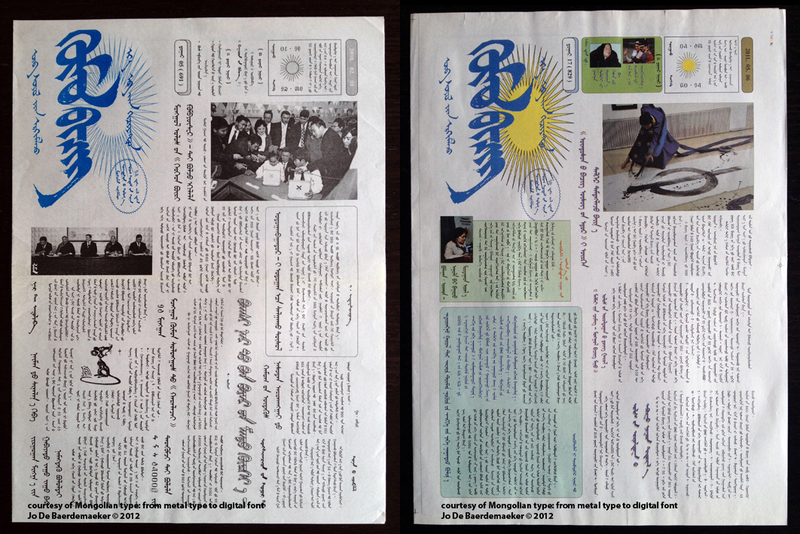 At present, Khumuun Bichig is the only newspaper in Mongolia that is typeset and printed in the Mongolian script, whereas the other national newspapers are all set in Cyrillic. It is hoped that with the President’s support for the Mongolian script, the readership of Khumuun Bichig will only increase, and that this newspaper continues to be the leading newspaper in and on Mongolian writing. This entry was posted in printing house / publisher and tagged Altantsetseg Sampil, Jo De Baerdemaeker, Khumuun Bichig, Mongolia, Mongolian newspaper, Mongolian script newspaper, typojo, Ulaanbaatar. Bookmark the permalink.